We had Lady Elaria order communion cups for the tasting. These are very small and ensured a good tasting, versus a drinking! The history and information was well received and the conversations during the tasting certainly stayed focused on the whiskey. I heard many an “ooohh” and “ahh” as different types of Whiskey’s were sampled for the first time. Fergus was on hand to provide 3DC history and answer general questions. Having an old time 3DC at the tasting is a must! Simple food was provided. Cheese and crackers, with bottles of water to clear the palate. I was pleasantly surprised that all persons present made a concerted effort to ensure their palate was ready for the next tasting. A better pavilion to provide more cover and reflect lighting to enhance the experience and give the ability to see and write tasting notes. More table space. With apx 16 bottles on the table, it was to small for food and water as well, or to give room for taking tasting notes. Perhaps clip boards for tasters to write notes on in the future. I am not sure how it has been done at prior tastings but we tried both letting the crowd pour for themselves and one or two individuals pour for everyone. I personally feel that a couple people pouring for the group was faster and kept the group on the same page better. Pour yourself a nice Irish measure of Irish Whiskey. Warm the whiskey in the glass by cupping it between both hands. Sit back and admire the color. Nose the glass, embrace the aromas and distinct flavors of this dram. Taste the whiskey. Roll it around on your tongue, let your palate marvel the delights of the flavors that the whiskey is bringing it. Savor the taste explosion spreading across your palate in the aftertaste of the tasting. The only aged Pure Pot still whiskey on sale today. Matured for a minimum of 12 years in Oloroso Sherry and Bourbon casks. Redbreast is a very special whiskey within the Irish Distillers fortified as it’s the only 12 year old Pure Pot Still available. It was first launched in 1939 as the brand name given to the pot still whiskey supplied by Jameson to whiskey bonders before bottling at the distillery became the norm in 1968. Stocks of whiskey in bonders’ stores petered out, and thus Redbreast all but disappeared until its re-launch by the distillery in the 1990s as a single pot still whiskey. This pure pot still whiskey is matured for a minimum of 12 years in sherry casks and Bourbon barrels. Like all good pot still whiskeys, it is strongly flavored and assertive, making it a rare treat for the connoisseur of fine old whiskey. As all premium whiskeys can be consumed neat, but for a better tasting the recommendation from our Master Blender is to add a drop of water to dilute the alcohol and so release the intense flavours of this unique Pot Still Whiskey. Embodying all the centuries-old traditions of distilling at Bushmills, this is one of the very few Irish malt whiskeys available. Each drop of Bushmills Malt is carefully distilled three times and is made from 100% malted barley. The single malt Whiskey is matured for at least 10 years in specially selected American bourbon barrels stored in the warehouses adjoining the distillery. 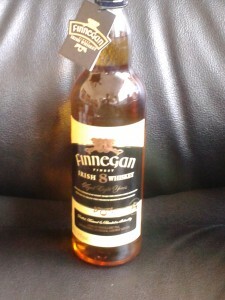 It’s here that the whiskey develops its full flavor, well-balanced character and light golden hue. Tullamore Dew 12-year-old is a deluxe blend with “a full, smooth, well-rounded whiskey, combining maltiness and pot still character. Sweet spicy notes overlay rich woody background from the bourbon casks used in maturation”. Its supreme quality has won it several international awards from whiskey connoisseurs in recent years. The 12 year old’s distinctive contemporary and classic packaging sets it apart from competitors. Named for the legendary Irish hero, Michael Collins Irish Whiskey is the finest ultra-premium Irish whiskey. Affectionately known as “The Big Fellow,” Collins was the spearhead of Ireland‘s struggle for independence and the architect of the Treaty of 1921, from which modern Ireland emerged. He died at the age of 31, but his heroic spirit lives on in Michael Collins Whiskey. Made at the only independent Irish-owned distillery in Ireland, Michael Collins is available in a blend and a single malt. With an aroma of honey, citrus, and malt notes, the blend has a taste that is clean and honey sweet with a fresh oak finish. Michael Collins Single Malt Irish Whiskey is well-rounded with a clean, malty, sweet citrus taste and wonderfully settled smoky flavor from the peat that lingers on the palate. Michael Collins Irish Whiskey’s the heroic spirit. Originally bearing the name “1780”, the year the Distillery was founded, this whiskey now features its age statement as its name. Matured for a minimum of 12 years in Oloroso Sherry and Bourbon casks. A full bodied, superbly mellow pot still Irish whiskey. “Uisce Beatha Eireannach” The Irish have always enjoyed two things: their drink and a good controversy. Irish Whiskey is a subject that incorporates both issues. While the exact origins are lost in the mists of time, it is generally accepted that the ancient Celts including the Scots, Irish, Cornish and Welsh knew how to distill grains at least as far back as 600 AD. Given that they lacked the climate to grow the more fragile grapevines, their use of cereals such as barley and rye, both of which grew well in the northern European climate, was a logical choice. Those Celts viewed their fiery brew as a gift from their gods that literally brought the dead to life and warmed even the coldest spirit. In fact, in Celtic, whisky is called “uisge beatha”-the water of life. Though sharing a common Celtic heritage in the art of whiskey making, pronounced differences in taste and style distinguish Irish Whiskeys from their Scottish counterparts. We’ll never know who invented the “water of life” but what is known is that Ireland and Scotland each developed their own interpretations of the art of distilling long before the first Roman ever trod on British soil. Irish whiskey differs from Scotch whisky from its very inception-the malting stage. The barley used for Scotch whisky is dried over open peat fires. The process allows the smoke to penetrate the barley malt and gives Scotch its distinctive smoky flavor. The malt in Irish whiskey is dried in sealed ovens, keeping only the pure malt flavor. Irish whiskey is then distilled three times (as opposed to twice for Scottish whisky), which further adds to the smoothness of its taste. To be called Irish, the whiskey has to be distilled from native grains in Ireland and stored in wooden casks for a minimum of three years. Distillers avoid using new oak casks because they believe the wood imparts a rough taste to the whiskey. Instead, many distillers select used barrels that once held the contents of another type of liquor, such as bourbon or rum. This practice accounts for subtle differences in whiskies that may originate from the same distillery. The rise of Irish whiskey occurred during the 16th century. Elizabeth I was said to be very fond of it, although she never took the opportunity to turn a profit on it. In fact it wasn’t until Christmas Day 1661 that a tax was first levied on the brew and by 1815, this tithe had increased to a crippling six shillings per gallon of whiskey. Ironically, this was also the zenith of Irish whiskey making with over 2000 stills believed to be in existence at the time. Many of these, however, produced “Poitien” or poteen as it was known; just as fiery as the Irish spirit itself, but illegal, since no tax was paid to the crown. There are four distinct styles of whiskey in the world – Irish, Scotch, American and Canadian – each with its own particular characteristics. While all are produced in a broadly similar way, there are substantial differences between different countries’ products including the choice of grains, number of distillations, type of stills used, maturation period and type of oak barrels used. To be an Irish Whiskey by law, (equally importantly tradition) 4 Criteria must be met. The Whiskey must mature for a minimum of 3 years. While the distinctive character of Irish whiskey comes from the distilling rather than blending, the skill of the blender is still important in creating individual blends. To do this, the blender uses widely varying ratios of pot still whiskey, grain whiskey and malt whiskey, so that blends can range from full bodied to mellow. Variations are also achieved through the use of old and young whiskies and different barrel types for maturation, such as those previously used for sherry or rum.Over the years, triple distillation has become the traditional Irish way of distilling whiskey. It’s during this process that we find the heart of the spirit which carries the most delicate alcohols. Triple distillation therefore produces a light style of whiskey. But light does not necessarily mean bland, Irish Whiskies can be subtle and smooth, yet full of flavor, with spicy, fruity and floral notes. In most Irish whiskeys, there is an absence of the smoky flavor that is so synonymous with many Scotch whiskies, because the corns of barley used for its production are not dried over a peat fire. The Irish use indirect heat to dry their barley so no smoke enters the production process. Irish whiskey is triple distilled to ensure exceptional smoothness. Irish whiskey is distilled three times compared with the normal two, to give extra purity and a smoother taste. No other whiskey in the world is distilled more than twice. Ireland‘s soft, temperate climate allows for a very slow and gentle maturation process, leading to very mellow and flavorsome whiskeys. Maturation is the “magical” process whereby new spirit is left to age in oak casks for many years to slowly transform into whiskey. Maturation removes the harsher, undesirable alcohols from the spirit. It also adds layers of complexity to the whiskey. Aged whiskey tends to be mellower and have more complex flavors and aromas. But maturation also gradually masks some of the whiskey’s initial flavors and characteristics, such as freshness and lighter fruity or floral notes. Therefore, older doesn’t always mean better, it simply means different. The principal ingredients in Irish Whiskies are malt, i.e. malted barley; unmalted barley and pure water.The malted barley used in Most Irish whiskies is dried in closed kilns to ensure a smooth natural taste. The absence of smoke in the malting process ensures that the clean taste of the malt and barley shine through in the final whiskey. The paradox of barley is that it doesn’t contain fermentable sugar but only starch. Early distillers discovered that if barley is allowed to sprout under spring-like conditions for a few days and then dried, the amount of alcohol subsequently obtained from brewing and fermentation is vastly greater than normal. Barley which has gone through this “Malting” process is called Malted barley. Malted barley is barley that has been allowed to sprout for a few days and then dried. Precise amounts of malted and unmalted barley are milled and then mixed with hot water in a “mash tun”. The starches in the mash are converted to sugars and the resultant liquid is called ‘wort’. Mashing is the process by which the grist is added to hot water (63 degrees Celsius) in a large vessel called a Mash Tun. During this process the starches in the barley are converted into fermentable sugars. The mashing process is complete when a hot sweet liquid called wort is drawn from the Mash Tun. “Wort” is separated from the residual grains and pumped into “wash backs”. The action of the yeast produces fermentation and the sugars in the wort are converted to a low strength alcohol or “wash”. Distilling creates new whiskey from the wash. The wash is heated in traditional large copper pot stills and Irish Whiskies are obtained only after three separate distillations. Each stage results in a smoother superior quality. Triple distillation is the key to smoothness. Irish Whiskies are matured in seasoned oak casks crafted by coopers, and remains undisturbed for a minimum of three years, many whiskies for much longer. Please refer to the 3DC website for additional history and more in depth discussion on the distillation process. Choosing a whiskey is all about finding the best one to suit your taste. There are several types of whiskey common to Ireland: Single Malt, Single Grain, Pure Pot Still and Blended Whiskey. They are all great whiskeys in their own right. Several distilleries make both blends and malts now it is you turn to find the right whiskey for you on every occasion.